With all of the modern emphasis on the pack instinct in dogs, and most training methods or models of dog behavior so "pack" focused, one of the many things that it seems every dog owner considers is whether or not to get another dog to expand the pack. Most of the time, my multiple-dog clients come to me after they've already gotten another dog as they try to sort out an even more complicated dynamic than what they were experiencing as a one-dog house. If people ask me whether or not they SHOULD get another dog, my answer is generally an emphatic NO WAY. Dog #1 seems very lonely, so the second dog will be a companion for the first dog. Dogs are social animals, aren't they? I just love dogs. Dogs are great. I need more dogs in my life. They're like my kids, and I need more so I can give more attention to more dogs. Dogs dogs dogs! "Companion Dog - 'cuz dogs are pack animals". While this is true, that dogs are pack animals, if you've read this article on how the prey instinct is the basis of social behavior in dogs, you might already know what I'm about to say. If there's one thing that dogs tend to not need in their lives in human-world, it's more "pack". What they ABSOLUTELY need is more prey - a way to fulfill their deepest desires (and resolve their deepest stress). That's where your energy as your dog's person should be spent.If your dog is lonely, that's telling me a couple of things. Perhaps you're busy with work and other obligations all day, and you feel like you don't have enough time for your dog. Well, if this is the case, do you think that you'll have enough time for TWO dogs? Often people think that the dogs will take care of each other, and that it will lessen their need for human interaction. It has been my experience that not only will two dogs not take care of each other, they will in fact require at least 3x the work that one dog required, simply because now, if you're interested in training your dogs, you will need to give time to each of them separately as well as together. If you leave them up to their own devices, it is almost guaranteed that they will get into collective mischief. Perhaps the loneliness that your sensing in your dog is really the lack of completeness in their lives because they don't get a chance to "go hunting". 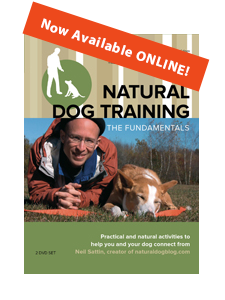 Natural Dog Training is all about harnessing your dogs prey instinct, both as a way to train specific obedience behaviors AND as a way to get deep down into your dog's deepest longings and satisfy them. Instead of thinking about getting your dog another canine companion, my suggestion would be for you to think about what it would take to be a better human companion - and be that. Honestly, if you spent 30 minutes each day devoting your attention fully to your dog's needs, giving them a chance to train, exercise, and make prey (and increasing their attraction to YOU in the process), then you would sense an enormous change in your dogs emotional state. The purpose of this blog is to help you do exactly that - be a better human for your dog - so please keep reading, and feel free to ask questions. "Dog for the kids". This reason almost deserves a post of its own, so I will probably revisit the issue of kids and dogs in another article. For the purposes of this topic, however, the answer is simple - teach your kids fun ways of interacting with the dog that you have. Introducing a new dog into the mix might have a few detrimental effects - it could make Dog #1 even MORE grumpy/aggressive and it will definitely mean more work for you (please do yourself a favor and don't expect your kids to be the ones "responsible" for a new dog's well-being). I've seen enormous change in grumpy old dogs with some dedication on the part of the owners. In my opinion, it'd be teaching your kids a much more valuable lesson to work with the old dog than it would to cast him aside in favor of a new puppy. Why is the ol' dog so grumpy, anyway? Is it that he doesn't have a moose in his life? "Dogs, dogs, and more dogs". Of all of the people who talk about getting another dog, these people are probably the best candidates, in the sense that they have all the time in the world to devote to the new additions. After all, that's what they do - their lives are dedicated to their dogs. Now there is nothing WRONG with that, per se. In fact, in some ways it's great. However, my one caution is this: in a lot of ways, our dogs often become surrogates for ourselves. And in the case where dogs are getting all of the attention, to the DETRIMENT of our giving ourselves what we need, it can make for some pretty dysfunctional canines. Many of my clients simply give TOO much attention to their dogs and not enough attention to themselves. In these situations, I often advise people to stop and think for a moment when they get the urge to give their dogs attention, and to ask themselves "what do I need right now?" They're often amazed to discover that their dogs weren't quite as needy as they thought - in fact, THEY were the ones who needed some attention. So to these people I might say "take the time that you WOULD be spending on dog #5, and instead read a book, or take a night class, or play the piano, or talk to your spouse, or do whatever it is that you really NEED to be doing for yourself". Both you and your dog(s) will be happier for it. In summary, if you're thinking about getting a second dog, please reconsider. Instead, try to be a better human for the dog you have. Since there ARE lots of dogs out in the world who need adoption, maybe you can start trying to convince some of your dog-less friends to adopt a dog for themselves. Your dogs can get together for play-dates. And of course the best way to convince your friends will be for them to see what a happy, fulfilling relationship you have with the canine who's already in your life. Thanks again for stopping by, and please let me know if you have any thoughts or questions, either through the comments, or by e-mailing me at neil at naturaldogblog dot com. Keep it real! Neil, I have three dogs, and man'oh'man is it a LOT of work. They need the individual time with me and away from the other dogs to blossom and I'm constantly balancing the dynamics of the household with husband, kids, cats, my own needs, home improvement, etc. It is not often that I get to say "That was a really good dog day", (Thankfully I get to say "that was a good kid day" more often) I tend to have to look at things in terms of the week or a few days rather than each day. Did they get exposed to a new or unfamiliar location? Did they get to play with me until they were ready to flop down? Did we get to work on a new skill? Meet some people? Get in the woods? Lay some tracks? Bask in the sun? Did I notice what each dog needed the most to be content? If I was rushing did I plant the seeds of a bad habit in someone? All that times three. I think you're right - that ultimately, when you have more than one dog, you have to broaden your perspective a bit. 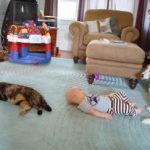 It's clear from the way that you talk about the situation (and from your being a dog professional) that you're well aware of what's required in the multi-dog life. Many (dare I say "most") people in this hectic modern age don't have that kind of time/energy. If they realize it before they go for dog #x, then so much the better. On the other hand, should they realize it "too late" - short from finding new homes for the new dog I think your insight would provide them with a healthy way to think about it - and to keep themselves from going bonkers! I hope that by bringing up the "two puppies at the same time" in this context you have effectively bridged the gap! An added point about that, however - when training a puppy, we want a chance to make an unmitigated impression on that puppy. Having another puppy around is guaranteed to produce distraction for both of the puppies, and it will substantially decrease your chances of being able to control the situation. If you do get two puppies at once, plan on spending even MORE time working with them separately. Even when Kevin Behan is raising canine siblings, he keeps them in relative isolation from each other. The idea is that by focusing on the prey instinct you are, in fact, teaching your dog how to be "social" - and it translates into their interaction with other dogs. We'll be addressing the notion of "socialization" in a future post - mainly to talk about how oversocialization (which is, really, overstimulation) can be even more problematic than undersocialization. This is definitely very informative and somewhat helps me decide whether or not to get another dog. However, what if our dog is completely happy and gets plenty of attention from us? What if we feel like she just loves other dogs so much that getting another one would simply be a good energy release and something that would keep her from boredom out in the yard during our working hours? As you'll see in other places on my blog, I'm a huge advocate of down-time for our dogs. That time while you're away could be great time for your dog to decompress and relax - all of which is just as beneficial as "energy release". There are many exercises on this blog devoted to showing owners how to satisfy a dog's deepest desires all on their own. And that utter satisfaction actually rarely happens in dog-to-dog interaction, though it can, of course, be "satisfying" on some level and physically exhausting. Also, remember that by getting a second dog, you are introducing a whole NEW variable into the dynamic - a new dog that will require time and attention from you. If you're away at work and worried about your dog's boredom, how will your dog deal with the fact that you now have to spend MORE time away - working on training/etc. with dog #2? I've also noticed that dog behavior is flexible, so by bringing a new dog into the family the odds are that you will see different behaviors in your current dog PLUS the chances are that you'll end up with two dogs who are the opposite of each other - rather than two who are the same in temperament. Their proximity to each other will have the tendency to push them to different points on the behavioral spectrum. So if your current dog is low maintenance, then you can almost count on dog #2 being...well...high maintenance. This isn't universally true, of course - and plenty of people have successful multiple dog households. The point of this article is not to completely discourage people from getting a second dog, it is simply to make sure that they are honest with themselves about the REALITY of dog #2 before taking the plunge. Almost ALWAYS it means more work for you, so bear that in mind. Good luck with your decision! Wow, wish I would have read this blog beforeeee I got my second dog. I had a wonderful Australian Labradoodle, she was a dream to train and very easy keeper no issues what so ever....Well, I thought one was good two would be better another dog to play with the first. So, we got a sister of hers six months later from another litter (different sires). MISTAKE, not only was her personality totally the opposite of her sisters, she was a handful from the getgo. Long story short, she pretty much destroyed our furniture, everything outside that she could chew up she did, and to top it off her sister hated her from the moment she came home. We kept her until she was a year old and finally the fighting had escalated between the sisters to the point the first dog punctured the leg of the second. The second pup never learned to quit nagging the first and she had enough. We decided the best for both was to relocate the pup to another home without dogs just humans...She is very happy now with her human kids and playmates and not her older sister who hasn't missed her a bit. Live and learn.